Sometimes, when you’re baking, you jump ahead of yourself. You’re making a recipe that calls for chocolate, and suddenly you realize you have no cocoa powder in your pantry. Don’t despair. You can substitute another common pantry item to finish the recipe until you make your next trip to the grocery store. The most obvious alternative to unsweetened cocoa powder is Dutch-process cocoa, which is pH neutral. Because its acidity level is lower than that of regular cocoa powder, you’ll need to add an additional ingredient, such as cream of tartar, lemon juice or white vinegar, to increase the acidity. 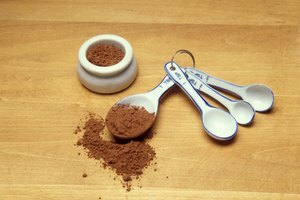 Add 1/8 teaspoon of your acid for every 3 tablespoons of Dutch-processed cocoa powder. 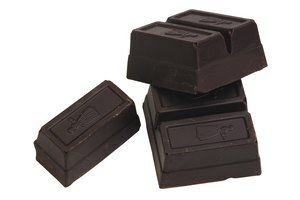 Unsweetened baking chocolate is another unsweetened cocoa powder replacement option. For every 3 tablespoons of cocoa powder the recipe calls for, substitute 1 ounce of unsweetened baking chocolate. Don’t forget to omit 1 tablespoon of fat, whether it’s butter, oil or shortening, from the recipe when you do so: Baking chocolate has a higher fat content. Melt the chocolate; then combine with the sugar and butter. Harkening back to the ’70s, carob powder or chips also can be used as a chocolate substitute. Carob powder is an easy substitute because you can use it in a 1-to1 ratio as an alternative to cocoa powder. 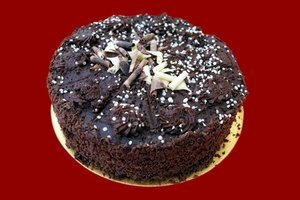 In other words, you can simply use the same amount of carob powder as you would cocoa powder. To use carob chips, for every 3 tablespoons of cocoa powder, use 1 ounce of melted chips combined with the creamed sugar and butter. 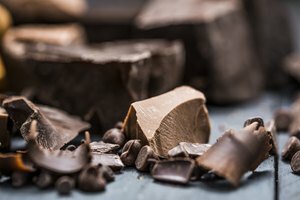 Dutch-processed cocoa powder and unsweetened baking chocolate are the best alternatives to traditional cocoa powder, but in a pinch, you also can substitute some pre-mixed or pre-made options. For example, leftover chocolate from holidays, such as a dark chocolate Halloween candy bar, a hollow Santa or solid chocolate Easter egg can be melted down and incorporated when you’re creaming the sugar and butter in a recipe. Chocolate drink mix, such as hot chocolate mix, Nesquik, breakfast drink mixes like Ovaltine or Carnation Breakfast Essentials, can be substituted for cocoa powder. Remember to remove about a tablespoon of sugar from the recipe for each packet of powdered mix. While all of these substitutes will work in a pinch, some work better than others. Unsweetened cocoa powder tends to have more cocoa solids, the substance that gives recipes that distinct, deep chocolate flavor. While these substitutes give the recipe a chocolatey flavor, it will not be as dense or as chocolate-forward as cocoa powder. Sweeter cocoa powder replacements also contain more sugar. Again, this will do in a snap, but it will increase the overall sweetness of a dish rather than a more intense chocolate flavor. Consider the options on hand at home, and choose the one that probably has the most cocoa solids. 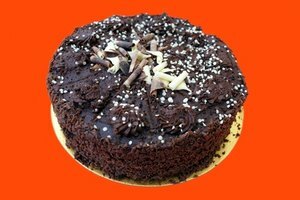 Cocoa powder substitutes also provide a slightly different texture in the overall finished baked good. Again, use the substitute guidelines to minimize the impact of the change in texture, such as cutting back on fats or increasing the amount of acid.